Shipping Costs: We will add $60 USD shipping costs for UPS Ground to your order for shipments in the contiguous USA. All other locations will have shipping costs added to your order at actual cost. All order within the Continental United States are shipped via UPS ground or Fedex ground. UPS 3-day Orange or 2-day Blue Label available for rush orders. COD Orders: At this time we can not accept COD orders for Champion products. Please keep in mind that all Champion hard bags are made to order and they do not keep things 'in stock.' Full payment plus shipping will be charged when orders are placed. See Hard Bags Returns / Order Cancellation Policy below. Two Bag "Carry-Out" Liners ( canvas like material - same size as the hard bags, with handles, and a zipper ) See photo below. 1. 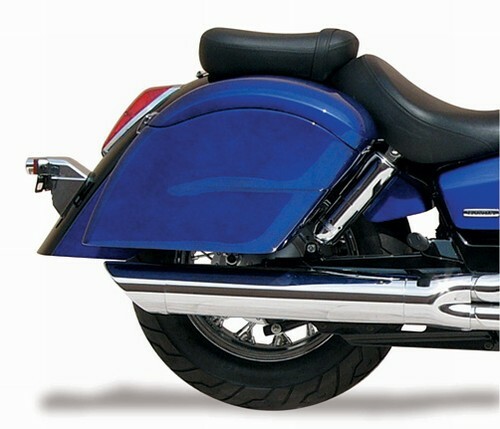 It is Champion's policy to paint products to match as closely as possible with the customer's motorcycle original paint system color(s) for hard bags, but not to guarantee a precise color-match. 2. Champion does this by using paint products from the same suppliers who provide paint to the OEM motorcycle manufacturers. Champion also checks the final paint color(s) against the original equipment manufacturer's (OEM's) color sample at Champion's factory, in full sunlight. In the case of a motorcycle which may have faded, Champion will use the closest possible paint formulation matching the original equipment manufacturer's (OEM's) color paint color scheme. 3. 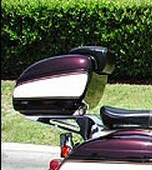 In many cases Champion will request a sample panel or other painted part from the customer's bike, in order to confirm the color information (name or paint code) provided to avoid any misunderstanding or misinterpretation of color related information. This does not imply that Champion will guarantee a precise match with that color. 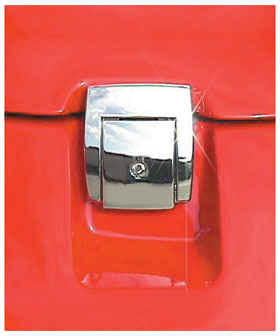 In ALL cases for which pin-stripping is required Champion will require a sample panel, or other representative painted, pin-stripped part from the bike. American Side Road Cycles will let you know if a sample panel or other painted part is required. NOTE THAT CUSTOMERS WILL RECEIVE A CREDIT ON THEIR ORDER TO COVER ACTUAL SHIPPING COSTS TO CHAMPION UP TO $60 USD. Primer only Paint Ready Hard Bags Returns / Order Cancellation Policy: Primer only Paint-Ready Hard Bags are designed to fit your specific motorcycle make & model. Please keep in mind that all Champion hard bags are made to order and they do not keep things 'in stock.' Once an order is placed, customers will only be able to cancel their Primer only Paint-Ready Hard Bags order before they ship, but their is a $50 re- stocking fee. After Hard Bags have shipped, orders can not be returned and orders can not be cancelled. Champion says they can't take back Hard Bags as we can't sell used bags as a manufacturer. Color Match, Single Tone & Two Tone Hard Bags Returns / Order Cancellation Policy: Please keep in mind that all Champion hard bags are made to order and they do not keep things 'in stock.' Once an order is placed, customers will have a very short time, maybe three to four days, before your hard bags receive their finish paint jobs. An order maybe cancelled before the bags receive their customer specific finish paint jobs in this three to four day period, but their is a $50 re-stocking fee. 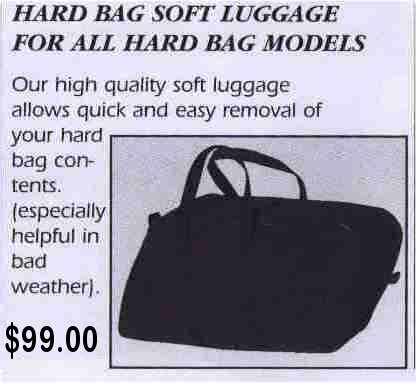 After Hard Bags have received customer specific finish paint jobs, orders can not be returned and orders can not be cancelled. 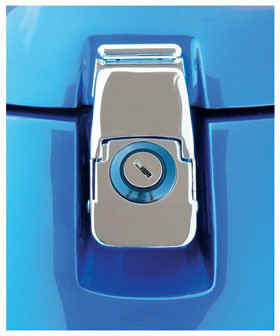 * High-quality chrome lock to safeguard valuables (See photos of the New Improved Lock Design below). What does "primer, paint-ready" mean? Answer: This means that Champion takes the "gel coat" Hard Bags and does all of the prep work, including priming, to make the Hard Bags ready for finish painting with no further prep required, other than dusting it off. What does "gel coat" mean? Answer: That means the Hard Bags are fresh from the fiberglass mold. The black "gel coat" is sprayed into the mould before the fiberglass and helps to "release" the cured fiberglass component from its mould. The gel coat Hard Bags will need some sanding and other prep to make it ready for priming. Do the Hard Bags come with a Limited Warranty? Answer: Yes, once your register your Limited Warranty via the Champion web site, all Champion Hard Bags have a one year warranty against defects in material and workmanship, and a 90 Day Warranty on Paint. How long will it take to get my new Hard Bags? Answer: Champion normally ships your new Hard Bags within one week for Primer only Paint Ready Hard Bags, and two to three weeks for Color Match, Single Tone & Two Tone painted Hard Bags depending on your specification, and if any custom work is being done. 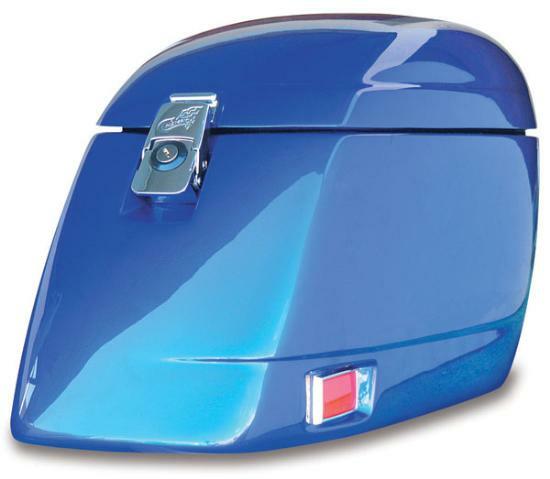 Note that if Champion requests a sample panel or other painted part from the customer's bike, in order to confirm the color information to avoid any misunderstanding or misinterpretation of color related information, it may take extra time depending on how fast the customer can ship the sample panel or other painted part to Champion. American Side Road Cycles will let you know if this is required (mostly for older motorcycles).